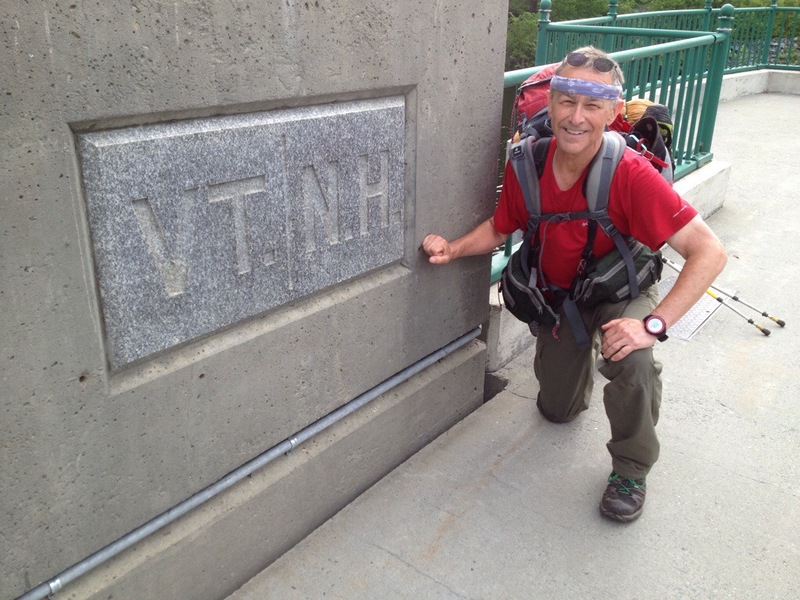 Hanover, NH, AT NOBO mile 1742.6, Tuesday June 10, 2014 — Only one more state after New Hampshire. Progress? You bet. I wish I’d known it was commencement weekend. Expectations of a slumbering college town awaiting next September turned into the reality of a quaint New England town chockablock with newly minted masters and mistresses of the universe, hovered over by doting parents proud of their trophy children. They jammed the streets, restaurants and Starbucks. Crashing this party were two hikers definitely in need of a town stop. Judging from the down-nosed glances from the folks uniformed in pink pollo shirts, puddy-colored walking shorts and shod in docksiders, they wished we were people more like them. We stashed our gear at the Dartmouth Outing Club to avoid schlepping it around all day, and to make ourselves a bit more presentable. In the end, both we and the other people survived the encounter. In fact, Swayed and I were in gelato heaven having discovered an ice cream parlor on our way to the local (fashion) outfitter. The outfitter sells North Face to students. Full stop. End of story. We were as out of place in there as we might have been at a country club. When we arrived the recommended restaurant, guess what? 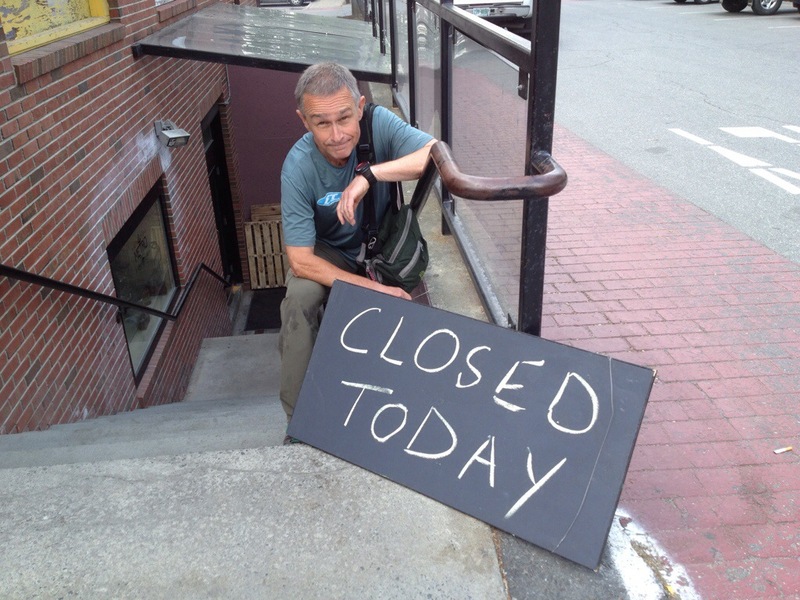 It was closed – on a day when hot and cold customers were lined up around the corner. Stuff being closed has been the backstory of this hike. I just thought luck would change after Memorial Day. Note the fresh shirt. At the end of the day my cousin and her husband snatched us to the friendly confines of their lovely home and a dinner, following shower, at a nearby restaurant. Thanks cuz! Any chance you’ll be to Mount Madison on Sunday? I’m bringing my 12-year-old on his first serious day hike then. Don’t know yet. Will try and let you know. a cool breeze in summer; snow in winter. Sleeping under the stars – aka cowboy camping – is on my list. Thanks for your thoughts and support. Congratulations, Jim! You’ve been nominated for the Liebster Award! Well, Jim, the unofficial rules, as I understand them, go something like this: on a post you thank the person who nominated you; answer the 11 questions posed to you; nominate other bloggers for the award; and, post 11 questions for new bloggers. I would imagine, since you’re already on the trail, you can do this whenever possible — even when you’re finished hiking, since I know how time-consuming the AT can be. Meanwhile, just bask in the award and get around to the assignment as time allows. I, too, was confused at first about how to respond to the award bestowed on me. I took to Google to find out what other bloggers have done. Check out Rockin’s Liebster Award post on http://www.ladyonarock.com to get a better idea. Happy trails! Many thanks! I leave civilization in the morning and will resurface in about two weeks when I reach Gorham, NH.